Sensei Beal started training in Karate at the age of 5 with her dad, mom and sister. Eventually only her father (Master Beal) and her remained studying under the Carolina Karate Association. When Cher reached the highest ranking belt she could for her age group, she took a leave and continued her formal training at around the age of 13. 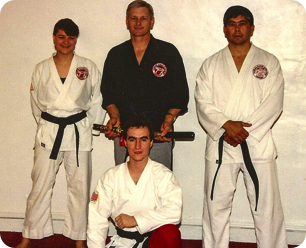 She continued training until she achieved her black belt at the age of 17 with Carolina Karate Association. Cher stayed in martial arts until moving away to Wilmington to attend college. She has studied Aikido, Kyusho-Jitsu, Tuite. Thru the years she helped out at the Newton Martial Arts school between other classes. Outside the dojo, Cher stays busy with her two children, two dogs, running a poultry farm and working as a Marketing Director.